Artscape Youngplace » Blog Archive Vocal PLAY! There is no bad voice. Everybody can SING! 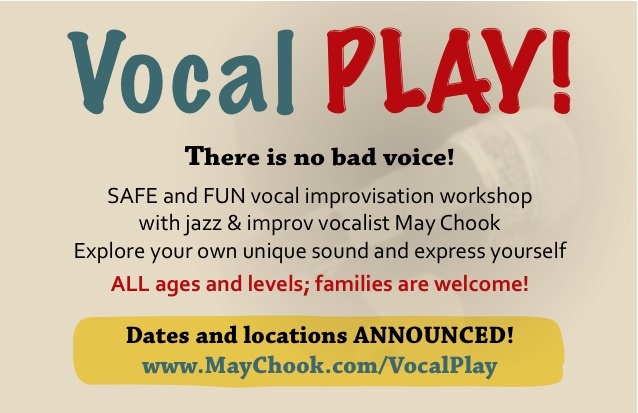 Join jazz and improvising vocalist May Chook for a SAFE and FUN vocal improvisation workshop. Let’s have fun singing, making funny sounds and speaking with style. Get to know new friends and learn singing tips. ALL ages and levels, families are welcome! Feel free to bring along songs / samples / questions for singing advice. It is going to be fun! A group of three: $15! A party of more than three? $5 each. The more people the merrier! Discounts are also applicable if you register for more than one sessions. Spaces are limited, email or visit website to register now! Not able to make it to this date? Sign up for monthly newsletter by emailing info[at]maychook[dot]com so that you won’t miss any updates.